Now I am sure that you heard the story about the old woman who lived in a shoe. But did you know that before this silly cow moved into an item of footwear, she lived in a leather jock-strap? Honestly, straight up, these guys and girls told me. Director: Shawn Levy; and Actors: Steve Martin, Hillary Duff, Tom Welling, and Bonnie Hunt. They told it to me in 2003, and it took them about 98 minutes. After all of the years living together as very affectionate husband and wife, both Tom and Kate Baker (Steve Martin and Bonnie Hunt), are suddenly really going places with their respective careers. Tom has finally found his golden job, as a coach to a big league football team, prompting him and his family to move away from their countryside home, and into a house within the city. Whilst Kate has been offered a publishing deal to promote her new book too, called 'Cheaper by the Dozen', prompting her to travel to New York City for a week or so, so that she can sell-sell-sell. However, what do their kids think about this? Their twelve kids. And will Tom be able to cope with them all on his own? Especially now he has to juggle his high profile work and his high maintenance children, both at the same time. Maybe his eldest daughter, Nora (Piper Perabo), who lives with her actor / boyfriend, Hank (Ashton Kutcher), can help him out? No - not really - Tom's brats see to that. Well what about his next two eldest children then, Charlie and Lorraine (Tom Welling and Hillary Duff), because they do live under the same roof? No - afraid not - they are having a bit of a rough time fitting in to their new surroundings at the moment. OK, so what does Tom do, huh? Is he able to balance his home life and his work life in relative harmony? You see, due to his newfound work load, Tom just can not seem be at two places at once, leaving his children feeling neglected, and leaving him feeling frustrated with his job. Worst still, is that his kids hate their new home, hate their new school, and basically hate how things are turning out, with their Mum away. Now eventually, over time, this very strained situation gets even more dire, when Tom tries to take his work home with him, inadvertently making things between him and his children blow up in his face, BOOM! His kid's starts rebel. He starts to falter in his job. Plus his wife gets wind that things on the home front, are not what Tom tells her on the phone. Still, that is most probably why what next transpires is a right family affair, huh? As Oprah comes a calling - a child goes a bawling - a family comes together - and a union grows stronger in harsher weather. Do you know what? 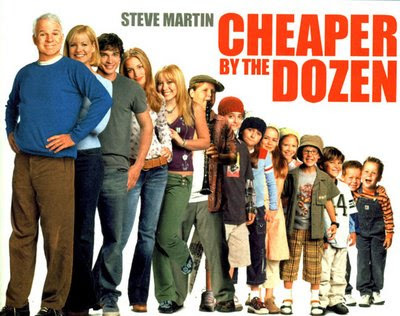 There are a couple of quite surprising facts surrounding 'Cheaper by the Dozen'. For example: (1) This film was very loosely based on a real life family, called the 'Gilbreth', whom wrote a book by the same name, which was made into a 50's movie by the same name too. 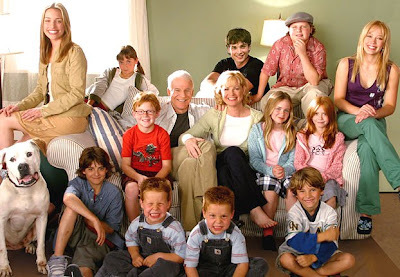 (2) Both Steve Martin and Bonnie Hunt do not have any children in real life. And (3) Steve was very happy to play a character called 'Tom Baker', because he is an old school 'Dr Who' fan. Now another thing that is also surprising about this film as well, is how its basic pretext is presented just like a stray family member, in both style, content, and structure. You see, in essence, this flick is a rollercoaster ride of a fun family adventure, with a diverse set of children, a bold and obvious story-line, and a play it by numbers tale that is neglected like a child within a large family unit. Honestly, at times this film just flimflams between the different children and the parents so much, that the basic arc of the larger tale does get lost within the scheme of things. Moreover, some of the sub-plots are not fleshed out that well either, and just come across as filler within a ninety minute gap. 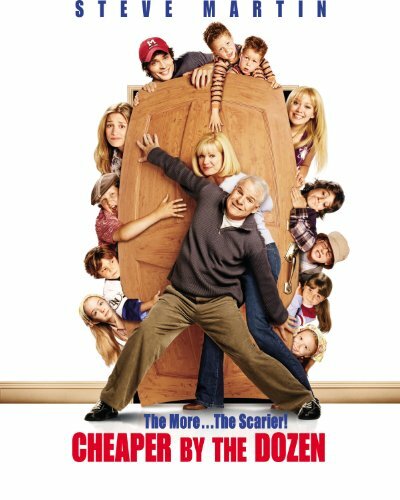 Thankfully, though, on a more positive note, also just like a family member, there is warmth within 'Cheaper by the Dozen' too. On occasion, some of the more dramatic and poignant scenes were played out with a nice amount of emotion -- which did manage to bring a tear to my eye or a smile to my face here and there. And in addition to this, I really have to commend all the cast - including the brats - because they were all very good as single faceted characters. Now my own personal favorites where the little mites are concerted, is that little sod with the glasses (because there was pathos to this chap), the twins (because they were funny), plus that fat kid and the dark-haired leader-girl (mainly because of what they represented). Please note, this is not to say that the other 'little darling' weren't as charismatic. Just that I associated with these noted kids the most. Oh! And I do have to mention Ashton Kutcher, Tom Welling, and Hillary Duff too! Because all three of these 'pretty people' really did surprise me in their comedic and acting savvy, making their fleeting parts more memorable than what they were allowed to be. Overall, this 'Steve Martin film' is like many of the recent 'Steve Martin films'. Conceptually the pretext was a nice one. Thematically the through-line was a philandering one. And by in large this movie was a good-bad film, with some nice pieces of additional dramatic tension thrown in for good measure. Don't you agree Tom? Well, sod you then, and go to your room without supper.